*My home studio accommodates groups of up to 4 with everything provided and is less expensive since no commute fee is added. Conveniently located in Roanoke County near Bonsack, come enjoy the privacy of my sacred space. Cost is $50 for one person or $60 for 2-4 person groups. ​*Have a larger group wanting to take a private class? Private weekday and weekend classes can accommodate up to 20 at a studio located in NW Roanoke conveniently at Town Square. Contact me for special pricing and to put you on the calendar. ​*Have your own space? I'll come to you! Cost for on-site sessions differ based on the location, frequency of the class offering, what is provided, and how many people attend. Typical cost is between $75 and $110. Contact me for your specific pricing. We have come a long way from the days when corporate wellness programs were viewed as good-to-have rather than as a need-to-have. Employee wellness has become a strategic imperative for most organizations across the globe and not without reason. An increasing number of studies point to evidence that the returns on wellness programs go way beyond healthy and happy employees. A study by Towers Watson Wyatt and the National Business Group on Health shows that organizations with highly effective wellness programs report significantly lower voluntary attrition than do those whose programs have low effectiveness (9% vs. 15%). On the other hand, an internal assessment by Johnson & Johnson found that the return on their wellness programs have been $2.71 for every dollar spent, resulting in cumulative savings of $250 million on health care costs for the company over the past decade. As workplace wellness gradually becomes the norm, offering membership passes to a fitness centre is no longer enough to generate and sustain employee interest in wellness. A growing number of businesses are finding that offering Yoga to their employees is a low-cost, preventive and holistic healthcare measure, making the discipline a resonating success with human resource teams looking for strategic returns on their wellness investments. Regular practitioners of Yoga would stress that its many benefits include emotional wellness, improved strength, flexibility, balance and postural alignment amongst others. In the boardrooms of companies, Yoga adds dimensions such as stress reduction, energy-enhancement, enhanced creativity and focus and healing for employees and convenience and increased productivity for the employer. Yoga is not just about being able to perform complicated poses and movements. It is a holistic approach to physical and mental health, as well as a person’s well-being and personal growth. 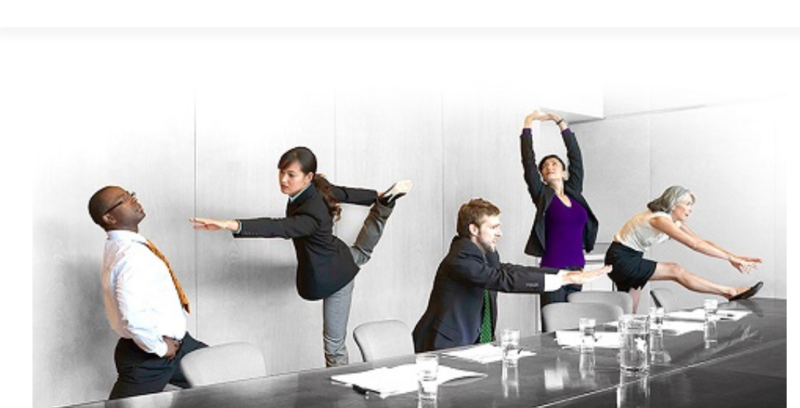 Corporate Yoga is the extended concept of working peacefully in the midst of a hectic corporate environment. Depression is the most disabling illness for the corporate sector, second only to cardio-vascular diseases. Long hours, multi-tasking, stiff competition, rigorous commute, irregular eating habits, sedentary desk jobs and bad sitting postures, all combine to create a pool of highly stressed, inefficient and thus despairing workforce. It is the only form of exercise known to increase flexibility, strength, balance, concentration and breath capacity while reducing stress and anxiety. Yoga also helps boost morale. Specialized classes, even if they are once every quarter, such as Chair Yoga help show employees stretches that they can do while at their desks. There is conclusive evidence supporting the fact that offering even one Yoga session in a week brings about noted changes in employee behavior by helping them manage stress better, enhance clarity and creative thinking, improve communication skills, cultivate leadership and teamwork, and increase overall effectiveness in the workplace. Perhaps the strongest reason for incorporating Yoga into your employees’ wellness routine is the ease with which a corporate Yoga program can be implemented with any kind of resources. The only equipment required for a session of Yoga are some floor mats and a bunch of willing participants with a strong desire for a healthier, more fulfilled life. A Yoga program can be conducted just about anywhere such as a conference room or an empty lunchroom. Yoga in general is geared for people of all levels and age groups and can be tailored to address the needs of people with completely different fitness levels. Yoga equipment such as mats, blocks, straps, etc may be provided for your employees by request. Contact me today to set up the new wellness program at your workplace for 2019.